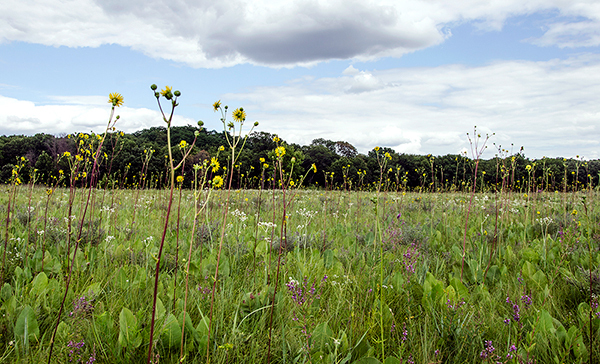 Ecological communities at the Arboretum comprise woodlands, savannas, prairies, and wetlands. Since the Arboretum was founded on the idea of studying and re-establishing “original Wisconsin,” we also categorize these areas as remnants and restorations. Remnants refer to original, native ecological communities—that is, land that has been left relatively undisturbed since the end of the Wisconsin Glaciation in this area some 15,000 years ago. Remnants offer an opportunity to study and reflect upon what Wisconsin looked like before European settlement. Depending on the size and landscape characteristics, remnants often hold greater plant and animal diversity than disturbed or restored land. We manage several remnant areas at the Arboretum and throughout the state. Classifying areas of land as “remnant” or “restoration” can be complex. For example, some restorations also include areas of remnant vegetation. Others might be better classified as “creations,” especially if the area has been drastically modified so that restoring to the previous native community is no longer feasible. This page describes many of the Arboretum ecological communities and notes whether they are remnant or restorations. Before the mid-1800s, prairies and savannas covered most of southern Wisconsin. Today, approximately only 0.1% remains. Yet decades of intensive and continuing restoration and land management keep more than 300 native wildflowers, grasses, and sedges blooming at the Arboretum from spring through fall. Prairies and savannas evolved with frequent fire, and many plant species require fire to germinate, establish, and/or reproduce. Fire alone may not keep woody species at bay, but without this beneficial disturbance, trees and other woody vegetation will spread and shade out the wildflowers and grasses, reducing the diversity of plants. 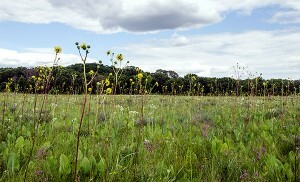 The world’s oldest restored prairie, Curtis Prairie occupies 73 acres south of the Visitor Center. 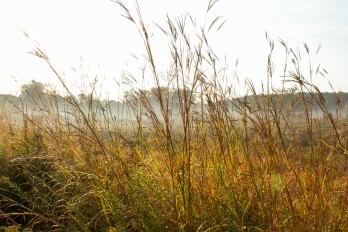 This predominantly tallgrass prairie shows off many native species, including big bluestem and Indian grasses that tower 7–8 feet tall and are especially colorful in fall. Approximately 16 acres consist primarily of wetland vegetation including prairie, shrub carr, sedge meadow, and emergent communities. Many classic experiments with planting techniques and the use of fire in prairie management took place here during the 1930s and ’40s. Most of Curtis Prairie is a restoration, but the northeast corner is actually a small remnant abundant with native species. Clonal shrubs have invaded many parts of the prairie, including the remnant, and threaten the native plant diversity. As part of ongoing land stewardship, staff and volunteers work hard to control these shrubs. This 47-acre restoration lies along the southern boundary of the Grady Tract, south of the Beltline. Botanist Henry Greene hand planted more than 130 species from 1942 through the early 1960s. In summer, the prairie wildflowers are especially showy amid the shorter prairie grasses, including little bluestem and prairie dropseed. The majority of the prairie is highly diverse, boasting over 220 native species. Staff and volunteers work to keep invasive woody shrubs from encroaching on the prairie. Unfortunately, the south edge of the prairie is threatened by urban stormwater runoff and has become dominated by invasive non-native reed canary grass. Oak savannas are species-rich ecological communities characterized by frequent fire and scattered trees. Though savannas once dominated the landscape of southern Wisconsin, ecologists are still learning about their composition, structure, and dynamics. This 14-acre oak savanna remnant is characterized by large bur oaks. This site was never plowed, however due to the suppression of fire after settlement, invasive shrubs colonized the understory, shading the wildflowers and grasses. These shrubs have been removed to reopen the historic savanna canopy. This former farm field was planted with acorns by Arboretum staff beginning in the 1950s in an effort to restore oak savanna. Today this 53-acre restoration more closely resembles a closed-canopy oak woodland than an oak savanna. Ongoing land care plans to reestablish an oak savanna ecosystem include thinning the oaks and removing non-savanna tree species. This savanna is adjacent to the Grady Oak Woods, part of the western edge of the Grady Tract. 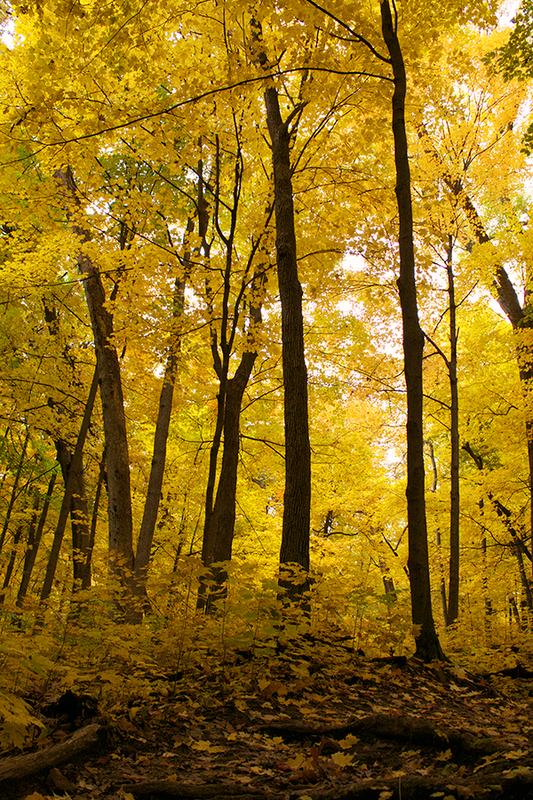 The climate and soils of southern Wisconsin favor deciduous forest. At the Arboretum, post-settlement fire suppression allowed oak grubs to grow in open spaces, creating closed-canopy forests. Noe Woods, Gallistel Woods, and Wingra Woods are examples of this historical process. The 41-acre Noe Woods is typical of many southern Wisconsin woods that developed post-settlement. Once a white and black oak savanna remnant, it is now a closed-canopy oak woodland. Most of the larger oaks are about 150 years old, but many non-savanna fire-intolerant tree species have colonized the site and reduced the amount of light reaching the forest floor. This has greatly diminished the diversity of the native ground layer. Gallistel Woods is a 28-acre former oak savanna. This community is considered a remnant since it was never plowed. 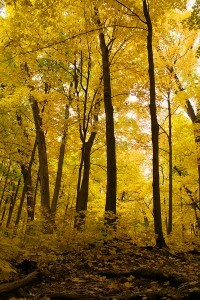 However, between 1941 and 1961 more than 1,000 sugar maple, red maple, basswood, beech, and ironwood seedlings were planted; these species are commonly found in Wisconsin southern mesic forests (habitat containing moderate moisture). Because of these plantings Gallistel can be thought of as both a remnant and a created community. This 52-acre block of oak woods is considered a remnant since it was never plowed for agriculture, only grazed. However, sugar maple, basswood, beech, hemlock, and others—trees that can grow in the shade of the oaks—were planted between 1943 and 1964. Wingra Woods is gradually changing to a shady forest, with sugar maple as the dominant species. On the north slope of the hill, hemlock and yellow birch were planted between 1943 and 1964 to replicate the forests of northern Wisconsin. This site could also be thought of as a “created community” because of the efforts to shift the tree composition to resemble that of a northern Wisconsin mesic forest. The Civilian Conservation Corps (CCC) planted most of the red and white pines in this 21-acre stand between 1933 and 1937. Small numbers of red maple and white birch were planted as well. Between 1949 and 1951, red and white pines were planted in the “prairie addition,” an area between Noe Woods and present Curtis Prairie. The Aldo Leopold Memorial Forest, or “Leopold Pines,” is the Arboretum’s oldest pine stand and has the largest trees. Arboretum staff and volunteers work to keep the forest free of buckthorn, Asian bittersweet, garlic mustard, and other invasive species. Thousands of white, red, and jack pines were planted in this 22-acre stand south of the Beltline between 1952 and 1960. Some red maple and paper birch are also present. Arboretum staff and volunteers work hard to keep the forest clear of Asian bittersweet, garlic mustard, and other invasive species. The Arboretum comprises approximately 400 acres of wetlands. Urban stormwater runoff threatens the quality of these wetlands. Arboretum wetland research and land management focus on how to restore biodiversity to these areas. 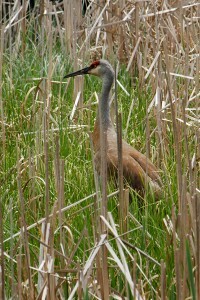 A sandhill crane seeks a nesting spot in a Teal Pond Wetlands marsh. This 186-acre wetland, site of a failed residential development in the early 1900s, once supported wild rice. Historical dredging and altered hydrology have created favorable conditions for hybrid cattail invasion. Ongoing land management seeks to reduce cattail density. Small pockets of remnant sedge meadow and other native plants are still found at the marsh. This 12-acre historic sedge meadow and wet and wet-mesic prairie complex was invaded by buckthorn and European alder due to fire suppression after European settlement. Although this complex site is affected by decades of invasive species and hydrology altered by stormwater inflows, a few small patches of remnant sedge meadow persist. As part of an extensive restoration project begun in 2013, these woody invasive species were cleared so native sedges and other wetland plants could recolonize. 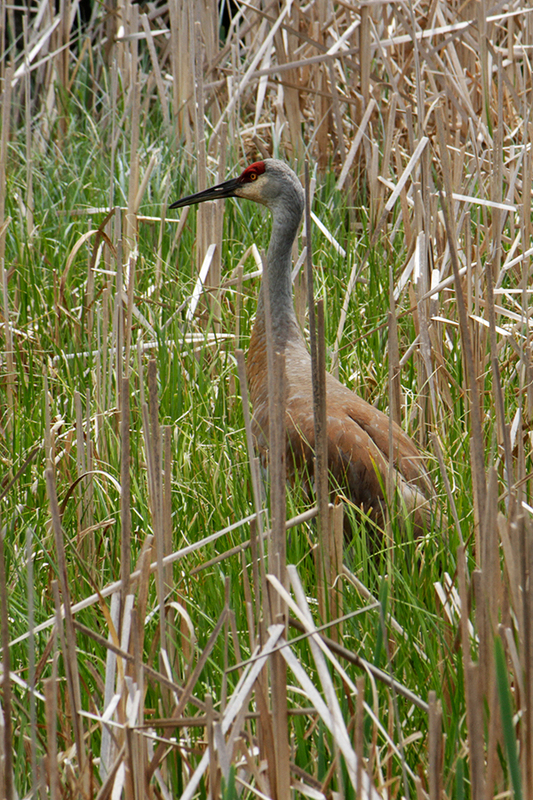 Target restoration goals include sedge meadow, open water, wet prairie, and oak savanna.